Hello everyone! 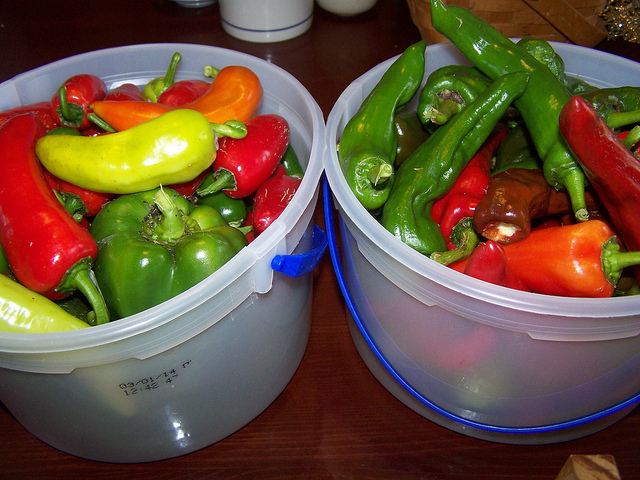 �I wanted to share with you all what I do with the last of our peppers. � I don’t care much for frozen or canned peppers. �I did this last year too and it seemed to work really well. I gather all that’s left in the garden. �This is a combination of bell, banana, jalapeno and anaheim. 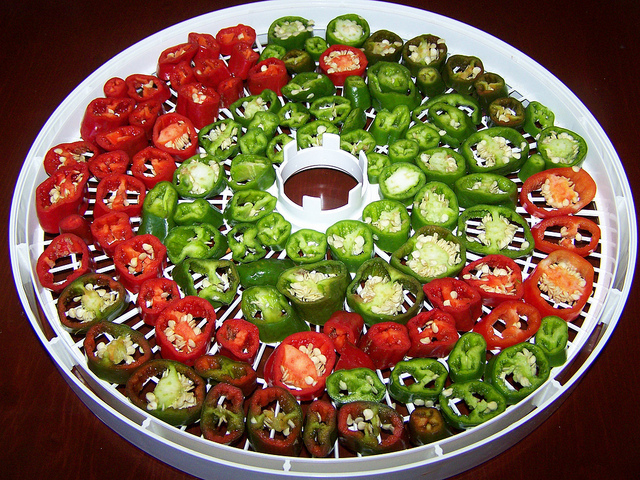 �I slice them about 1/2″ thick and dehydrate them. 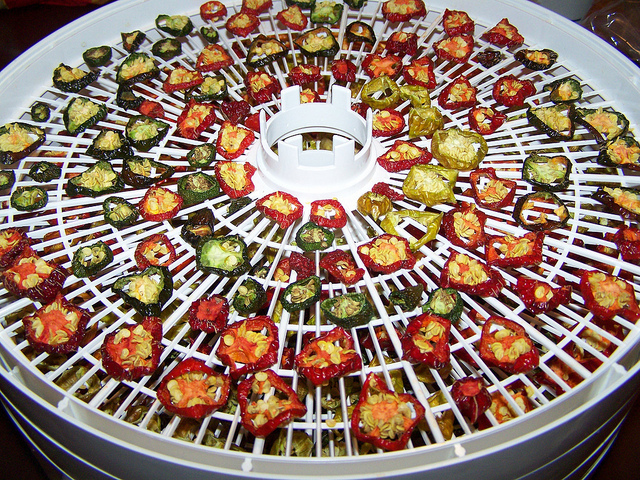 �This took about 6 hrs in my dehydrator. After they are dry, I put them into a blender. �I didn’t get a picture of this step but you all know what it looks like. �If you are using a lot of hot peppers and you have problems with the fumes from them, at this point you might want to use a mask. �They can be a little powerful coming up from the blender. This is the finished product. �Isn’t it beautiful. �I store this in an airtight container. �I like to have some on the table in a homemade shaker right beside the salt and pepper. 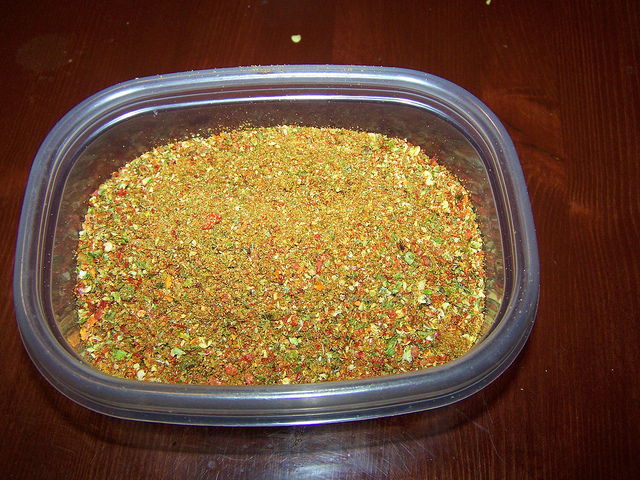 �It is a great seasoning to add to food. �I especially love it sprinkled on my eggs. If you like this idea, check out�http://homejoys.blogspot.com/2013/10/how-to-make-tomato-powder.html and see what she did with tomatoes. �Our tomatoes are gone but I really want to try this next year. �I hope you all have a great day and God bless. Your pepper flakes are beautiful! Madison is working on filling our dehydrator trays right now. 🙂 I love pepper flakes on spaghetti and pizza. I like your idea of using the blender. Great job! I have not done this before. We dry apples, a lot of them. That reminded me that we had some in last night and I just pulled them out a little late, but they are okay. *smile* Have a great day. Sincerely, Mommy of two growing blessings & so much more! What a great idea, thanks for sharing! Awesome! That looks so beautiful. That looks awesome! What kind of dehydrater do you use (brand name?) I have thought about getting one to use for drying various things. There are just so many out there that I’m not sure what the best one would be. Hi Donna.. I was given a huge pepper plant that has small yellow peppers on it.. There are about 30 and I was wondering what to do with them.. They are very hot, though so I am not sure if this would work for us as we do not like hot pepper as much as you folks.. Yours looks awesome.. Thanks for the other link, too..